In his roundup of highlights from the Nashville Film Festival, Nathaniel Rogers chalks up a highly plausible contender for Best Actor honours this awards season: Hal Holbrook in “That Evening Sun,” an indie debut feature from Scott Teems. It’s based on the short story by William Gay about a farmer who escapes the old folks home and returns to his beloved farm only to find it occupied by new tenants. The film is well directed by Scott Teems, graduating from short films to his first feature, and an Oscar campaign could materialize for Holbrook if this movie gets a solid enough release. Holbrook plays a stubborn old ornery codger… one could say it’s an Eastwoodish role with less of Clint’s squinty menace and more of Hal’s weary sensitivity. No indication yet of what kind of release the film might enjoy, but it sounds like one to keep an eye on. Powerful trailer after the cut. 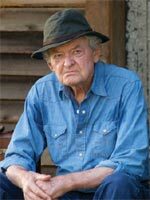 I remember back in early 2008 when people were feeling remorse for Hal Holbrook not winning the Best Supporting Actor Oscar because he likely wouldn’t get a chance to win one again due to his age. Well, here’s his second opportunity. Looks like something David Gordon Green would be making if he hadn’t sold out. He should of won in 2008 and not because he was old but becasue he was the best. Hope this is another great performance. Holbrook is always great, but he looks especially so in THAT EVENING SUN, another terrific-looking film. 2009 is really shaping up to be a special year! I saw it at the Atlanta Film Festival this time last week… where it won the jury narrative prize (congrats! well deserved!). Holbrook HAS to get a nomination. He is beyond brilliant. There could be some supporting nods too.